The Verdict: My verdict on the chicken parmigiana at the Pineapple Hotel can really be visually captured in just one image. Yes that’s right for those of you wondering: the totality of the ham included as part of my chicken parmigiana was a rectangle of ham that had been folded over a couple of times like a small used hanky. No matter how good the rest of the dish could have been the lack of ham means that there is no way this is Brisbane’s Best Parma. That said, it would not be a Parma review without examining the rest of the parts of the meal so if you would like to know more please read on. Otherwise we, you the reader and me the writer, already know how this review is going to end so I give you a free to stop reading! Chicken Breast: The menu spruiks this chicken breast as being from a free range chicken. I have no means of verifying that but I will say that this chicken breast was quite nice albeit in places it was significantly over cooked. Tomato Sauce: The sauce was the best part of this Parma. There was a great distribution of it and it tasted very nice. Ham: refer to the picture above. Need I say more? I probably do but given just how little ham there was all I will say is that this aspect of the meal could only have been worsened if it was spam that came out or none at all. Cheese: given the lack of ham one might have expected this to be a really cheesy Parma but frankly, as the photo above also illustrates, this Parma could have done with more cheese. There was just not enough of it! Side dishes: the other very strong aspect of this Parma was the chips. They were crispy and hot which is how any chip eater likes them. The salad could have been out of a packet from Coles: not for the first time in this review … Enough said. The price: I am specifically not reviewing the chicken parmigiana that I am testing based on price but it is worth mentioning that the Pineapple Hotel Parma sits on its bar snacks menu and is priced at $12. That is ridiculously cheap for a meal that, all whinging aside, did fill me. The venue: We chose to sit in the 5th quarter bar section of the Pineapple Hotel. If you like eating pub food in a pub environment, including TAB and bar close by coupled with the haunting aroma of old beer, man and vomit mixed together, as I do then you can not go wrong sitting here. If you were wondering: a. That is not sarcasm; and b. I genuinely loved sitting in this bar (just to be clear). The final word: it is sad to say, because I love this venue and the pricing is ridiculously good, that the rationing of the ham and cheese on this Parma made it just not very good. Obviously if you are look for a cheap meal mid week on your way home from the city this Parma is an option but only if you don’t like ham. Simples. 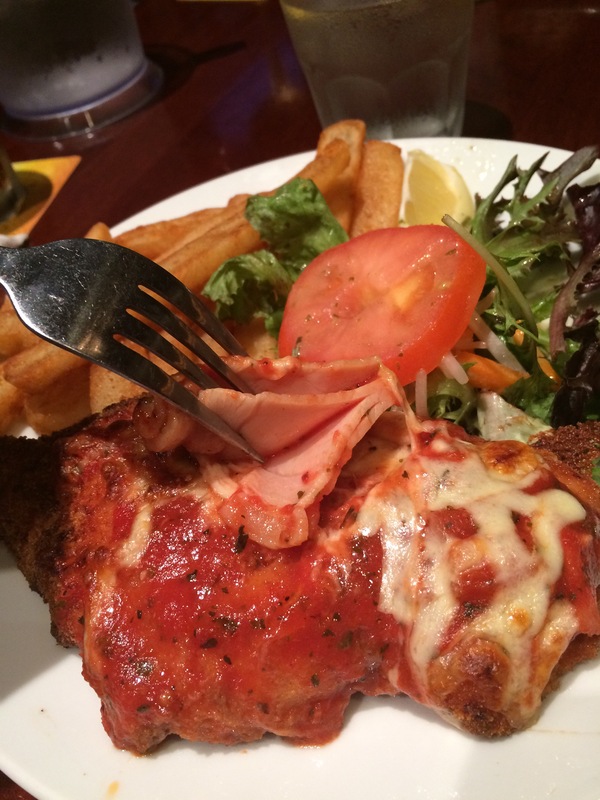 This entry was posted in Uncategorized and tagged Brisbane, brisbane best, chicken parmigiana, food, Pineapple Hotel. Bookmark the permalink. the venue was good if you enjoy the faint whiff of vomit whilst ordering your food and drinks.